Gerald Moreno, the fraudulent ‘researcher’ who invents things and attributes them to others shows once again that his vituperative hatefulness dominates his psyche again when he concocts a story that Swami Ambikananda ‘lambasted’ Robert Priddy. He never did any such thing! Swami Ambikananda was mostly a kindly if very difficult person, even though he dominated his followers who became like mice before a lion. When I realised the absurdity of it all, I wrote him a letter in which I asked him a number of questions. He was unable to answer them and, because I questioned some of the statements he had made [and which events confirmed were evidently untruths] I broke off relations with him. He replied with a literally drivelling letter to me, and I never visited him again (I only met him about 5 times across about 8 years, though I was regularly in touch with many of his circle for many years). 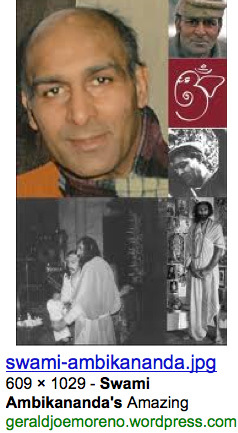 The fact is, he could simply not take it that anyone dared even question him as the ‘guru’. Much the same happened in the case of the one he named as president of his ashram, who left him after many years. Ambikananda was a very intuitive person with all the mental trappings of an Indian guru, but he was very authoritarian He evidently felt hurt that I drove across his wild and unlikely claims and advice like a tank. I heard later from a friend that he had said of me that I am a ‘skeptic tank’. He should have known better – as a Ramakrishna devotee – to speak unkindly of people behind their backs! Yes, Moreno! 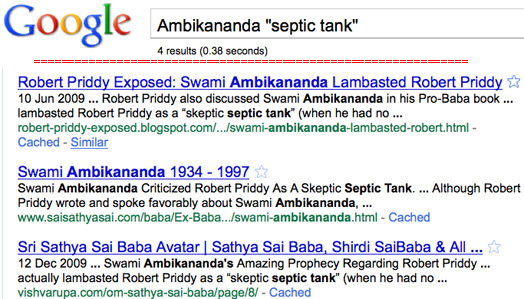 Gerald Moreno takes two words, changes them into “septic skeptic tank”, and blows his invention up into a full story about a “lambasting” by Swami Ambikananda. That is merely Moreno’s own septic interpretation of me. In his pernicious attempts to undermine my reputation and character, Moreno’s ever-malicious and ‘septic’ wording alone shows the vindictiveness and obsession. All but a very few who read Moreno’s views on Priddy will recognise how pathetic are his constant contrived allegations and false productions. The more he continues, the more trivial he becomes, and – due to his many web pages and blogs – the more prominent the controversy about Sathya Sai Baba becomes. He has no public support, not even from organization members (and they are well-advised in this if not in much else). Apropos the reliability of Ambikananda as a soothsayer, one who knew him has written of a book about him: “And it faithfully records his extraordinary blend of Mauritian patois, inspired revelations, obscure ramblings and determinedly syncretic vision where Jesus appears at the front door and the Divine Mother Kali manifests through his body. Miracles and wonders abound, and a sense of bemusement that he was as little known as he was, given that other teachers with far bigger Egos strode the stage at the time.” (One thinks of Sathya Sai Baba, who Swewami Ambikananda visited one and sat at darshan in Brindavan). That gives some idea of the kind of person Moreno evidently believes in and respects as percipient and wise… a fanatically religious ‘swami’ whose “obscure ramblings” were indeed sheer gabbledegook and whose often extremely incredulous beliefs were punctured by others. For example, he told of one person for saying the name ‘Yama’ because he thereby destroyed an entire world each time. The response was an endless stream of ‘Yama, Yama, Yama’! Ambikananda reportedly ran off in a frenzy and was found sleeping out next morning. As to his being a swami of the Ramakrishna order, he was not above marrying (a French lady) having a daughter, and abandoning them soon afterward. Not exactly sanathana dharma! This entry was posted on September 15, 2010 at 9:57 am	and is filed under Character assassination, Cults, disinformation, Gurus, Sathya Sai Baba. Tagged: joe108. You can follow any responses to this entry through the RSS 2.0 feed. You can skip to the end and leave a response. Pinging is currently not allowed.